I finished my final exam today. So it's back to the good old internet, and goodbye revision for now! Over the weekend we went away, but I spent most of the time revising- only pausing for a quick shoot (voila!) 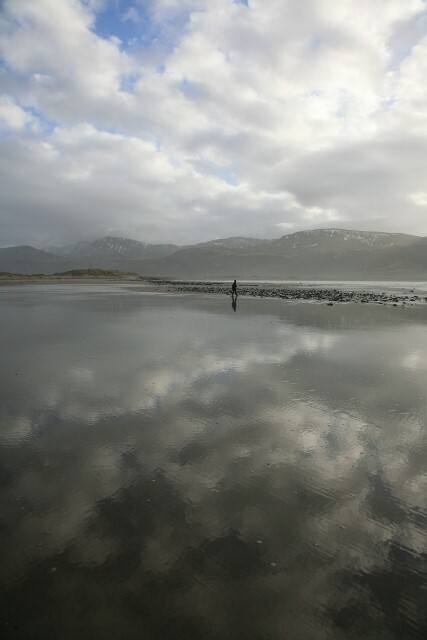 and a walk on the beach. Now I know this is a pretty stark monochrome palette, especially for me. I don't usually like such plain backgrounds in photos. I'm inspired by more of a Tim Walker-esque aesthetic. I feel that photography is made up of two parts- the person and their surroundings. I suppose living in the countryside does help! But this seems to work under the circumstances. On the day we left for the weekend, I had had a bit of a bad day at school,when I came home to find this big jumper lying on my bed. (Along with an amazing authentic riding jacket.) My lovely mum had found it in a local charity shop that day. That was it. I practically set up camp inside it for the whole weekend while looking at simultaneous equations and wavelengths... I love the fact that I can basically slob around in it, while still feeling moderately sophisticated, but then can properly dress up with appropriate accessories. Actually, I felt rather Mary Quant-ish wearing something this short, I'm much more of a long skirts girl. At the moment, it seems the only things that keep me warm enough are big woollen jumpers. (Often paired with a floral skirt and vintage hat a la 'Edge Of Love'). In these pictures I am wearing a vintage sixties necklace- another gem found among treasures under my bed during clearing out! The ring used to be my great-grandmothers and the shoes are thrifted. Now I think that may be it. Woah, already?! I have a feeling a few of my brain cells were probably burned up during exams this week, so hopefully I will have fully recovered them by the next post! Do not adjust your sets folks, full colour will be resumed in the next post- enough of this blackand white lark! This sweater is beautiful! I love the picture you took too and as you said, sometimes its good to have that comfy/fashionable sweater that you just love. That last photo is incredible. I love the way you styled your sweater. oh my god that sweater dress is gorgeous, and looks perfect on you! I loved all the references in this post of Mary Quant and Edge of Love! I loved all of the outfits in that movie. 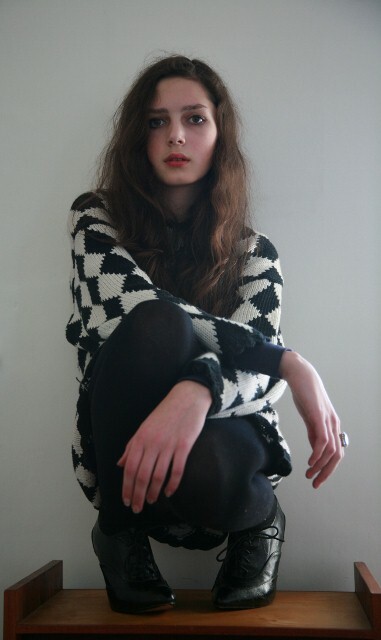 That harlequin jumper is gorgeous and looks so comfy. I hope your exams all went well! really gorgeous photos and sweater:):) i love the simple pattern--it really pops! I love that sweater! perfect! I want one!!! Cute sweater, you look so sweet and cuddly. what a chic sweater....I think it fits you perfectly....I love this look! I love your outfit. The sweater is so fabulous. I would definitely wear something like that. I love the final image... you captured it well. PS...I saw your blog from Kelly Anne's. I love it. Those shoes are amazing! You always find the best things in charity shops. The sweater is cute, you look great. Sorry to hear about your bad day - your mom is a sweetie for brightening your day! you have an awesome blog. I love your sweater dress! what a beautiful girl you are! Beautiful sweater! I also love your red lips! Together, so simple yet glamorous. This post is great, and yah, I have that same notion that black and whites aren't my thing either...I always need some type of pattern in an outfit too. But anyway, I like your shoes a lot! I was shown to your blog recently, and I am hooked! I know I've told you this before, but the camera loves you. But what is nice is that it is obviously a 2 way street because you have amazing style and confidence in front of the camera, also. Not to mention some very impressive photography skills of your own. That last picture is absolutely amazing! Wow! that sweater is fabuolous! I love it! Black and white stripes are really in! I am a new follower to your blog and I love it! Please come visit my blog! 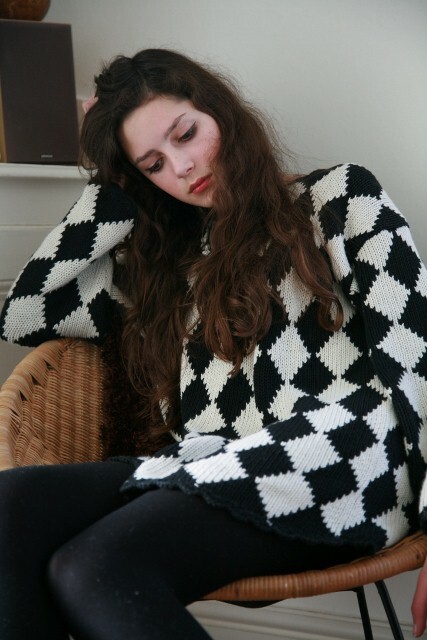 Love the harlequin pattern sweater! Fantastic as usual! That last photo is amazing! And I love the shoes your wearing in these shots. Actually in love with that jumper. Gorgeous photos too! Oh you lucky girl with your exams over! My second round is beginning on 5th March and I have practicals on 1st Feb and 4th Feb! I love the whole look. Your shoes and the oversize dress=perfection. You're very pretty. This dress-sweater looks so stunning on you! I live in the Irish countryside as well, and I find the surroundings so inspiring! I love the monochrome colour palette. The background is perfect for the outfit! everything great about it! Such an adorable sweater and its style perfectly! I love these pictures! The one at the beach is very beutiful :)The jewellery is also amazing. I HOPE YOU DID GOOD ON YOUR EXAMS! Cute jumper, that last picture is gorgeous. that sweater is so cute! beautifulbeautiful hair and lovely blog! The sweater is really gorgeous! This is such a luxury, to be back home with the cat snuggled up in bed, catching up on all the posts I've missed while we were away. Such a lovely story that after a bad day @ school you come home to find this fabulous jumper (& riding jacket) that your mom got you. I can't wait to meet you all sometime soon. I know it's not your normal look but sometimes it's good to shake things up, and you look great in it: and I love the choice of backgrounds. And it's apt with math, esp. geometry. Okay, enough praise.. got a lot more posts to enjoy! That's looking so cool. thanks for sharing. The Cutest girl i have ever seen in my life.